Yves Saint Laurent has always embodied the spirit of rebellious innovation, from the creation of Le Smoking suit in 1966 that changed the face of women's fashion forever, to the trend-igniting Mascara Vinyl Couture in 2017. Beginning with Fragrance and expanding into Makeup and Skincare, Yves Saint Laurent has always made bold beauty statements. Yves Saint Laurent Beauty extends beyond cosmetics into an attitude that is embedded in the colours, textures and materials. Each item is carefully designed, and embossed with the iconic YSL logo, a symbol of edgy, sophisticated glamour. Led by Global Beauty Director Tom Pecheux, Yves Saint Laurent is imbued with sensuality and a colourful playfulness, from bold lip colours to seductive fragrances. What is Yves Saint Laurent Beaute best known for? The Touche Éclat Radiant Touch highlighter pen is one of the most iconic makeup products of all time. A must-have in every makeup bag, this pen delivers the look of 8 hours sleep in a click. The ideal product to highlight, define and illuminate your features, this radiant pen shines a soft, diffused light on skin, with no shimmer or glitter. No longer just available in a pen, the Touche Éclat radiance also extends to primer and foundation, for a flawless complexion that never looks heavy or overdone. 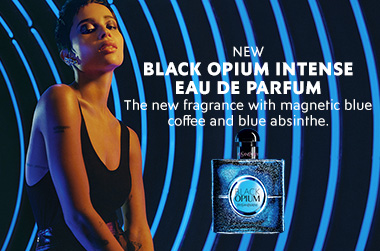 Black Opium is a modern, youthful interpretation of the classic scent. Assertive and unique, the Black Opium woman embodies the Yves Saint Laurent spirit. Rich black coffee contrasts with white florals for a fragrance that is irresistibly vibrant and sensual. The Yves Saint Laurent complexion is all about a radiant finish that lets skins natural beauty shine through. Top Secrets Instant Moisture Glow delivers instant and long-lasting hydration to skin to create the ideal makeup base. Silky and lightweight, skin is plumped, softened and smoothed. Yves Saint Laurent combines cutting-edge technology with luxurious French style and vibrant, playful colour. With a rich history spanning over half a century, Yves Saint Laurent continues to innovate and push the boundaries of glamourous style. Showing 20 products of 43.